Can you provide on-premise solutions instead of As a Service? ServiceVisual is a Managed Service Company that delivers it’ solution within a hybrid cloud / on-premise architecture. In order to measure the status of the Configuration Items that make up our customers key application services, we strategically place our data collection agents within our customer environments and then send the encrypted results back to our ServiceVisual Data Centre. 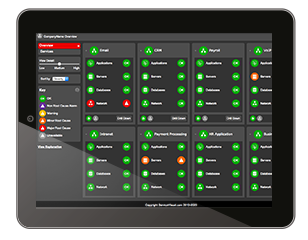 If you require a pure on-premise solution, our sister company KedronUK can assist you in building and configuring your own on-premise Application Service Monitoring Platform, with various levels of support available. What is the Architecture of the Service? ServiceVisual is a combination of Professional Service engagement, Application Service Management and Visualisation Technologies, Processes and Support. To understand our high level architecture, please view this diagram. For more in-depth information about our Service Architecture, please contact one of our Service Specialists. Do you provide Business Service Dashboards in addition to Application Service? To make sure we are able to on-board customer fast, and maintain their implementation efficiently, we focus our business on building the views that we believe IT Operations need and want to see; the Application Services and the infrastructure supporting those services. Business Service Management usually involves the inclusion of Business Intelligence (BI) metrics from the customers BI Vendor which currently ServiceVisual does not integrate with. However, should you wish for a solution that can offer these additional metrics, our sister company, KedronUK can help with their range of On-Premise Solutions. How do you deal with Application Services that are in the “Cloud”? 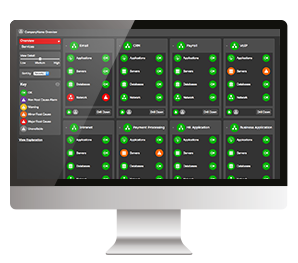 SaaS – Provide End user tests that measure and baseline performance of the Service, alert to SLA breach and prove whether performance degradation is caused by your LAN or WAN or the service itself. PaaS – Using several methods we can host agents on the hosted servers (depending on agreement with your provider) or remotely monitor availability. API’s – With both SaaS and PaaS, where vendors provide API’s into their service performance, ServiceVisual can integrate this information into it’s total service picture. How long does it take you to get the service up and running? To get an estimate for your unique environment, book yourself on our free of charge, non-obligatory Technical Assessment. What’s the difference between this and Application Performance Monitoring (APM)? Application Performance Monitoring focuses on monitoring the transactions and processes associated to a customers key applications. ServiceVisual includes aspects of this to measure the application components that make up and end to end service, but also intelligently monitors the network, host, VM, storage, database configuration items that work together to deliver the customer facing Application Service. It’s a true end-to-end solution that understand’s complex service configuration and performance and reflects that information in easy to understand dynamic dashboards. What’s the difference between this and Network Management? Network management typically uses SNMP, ICMP, Netflow, Packet Capture to provide Network / Infrastructure Managers with visibility of the availability and performance of infrastructure resources. Usually this information is grouped by location or device type. Alerts and dashboards are then viewed in the context of “device”. ServiceVisual uses the above mentioned datasources where appropriate, and also captures other none network related measurements from applications, databases, storage and end user perspectives. More importantly it then understands how these components work together to deliver the end-user service and visualises that via dynamic dashboards and service centric alerts and reports. How do you define Service availability and health? Collaborative Agreement of Service Availability Logic Definitions. Do I need to replace my existing tools / Can you integrate with them? ServiceVisual strongly believes that to ask your Network, Application, Server, Database and Storage teams to abandon the operational monitoring tools that they know and trust is a big ask and causes political issues within organisation that can affect staff moral. We offer an alternative approach, where we compliment those existing technologies with the Service Centric, End-to-End views and reports that Service Delivery Managers, IT Operation Managers and CTO’s want to see. By using our own technology stack, just to monitor the core service configuration items, it means we’re quicker, more cost effective and less disruptive. How is your solution Priced? The solution is priced on a monthly subscription price model. Monthly price is dictated by the number of services and the number of CI’s within that service. We are able to give accurate pricing for your unique environment following a free of charge and non obligatory Technical Assessment. Is There Contract Tie In? We are so confident in our technology, expertise and process that we offer a non contracted period for 3 months, where you can cancel at anytime. After this time we offer 1, 2 and 3 year subscriptions periods.